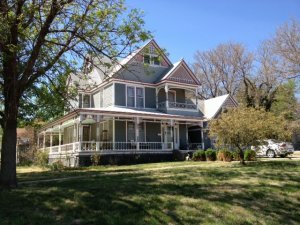 Larned, Kansas was built on the next-to-last hill in southwest Kansas. The last hill, of course, is Dodge City's fabled Boot Hill. The city drew its name from nearby Fort Larned, which operated from 1859 to 1878, and named for Colonel Benjamin F. Larned, U.S. Army Paymaster from July 1854 to his death September 6, 1862. 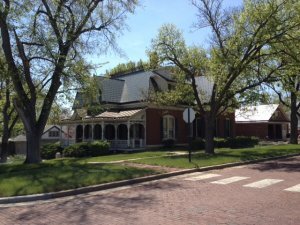 The Fort Larned National Historic Site is located approximately 5.5 miles (8.9 km) west of the city of Larned. 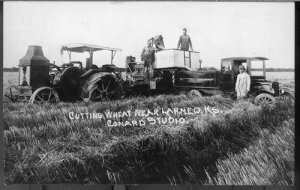 Wheat cutters near Larned, back in the day. Larned is the county seat of Pawnee County, a rural county with a population of about 7,000 people. 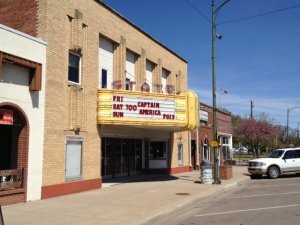 Still very operational with current movies and operated by a 501(c)(3) city-sponsored nonprofit corporation. 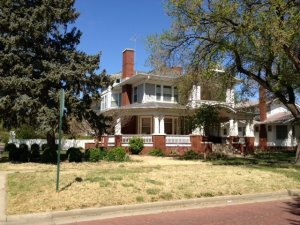 This house was built by Judge Charles E. Lobdell of the 34th Judicial District (Pawnee Co.) in the early 20th century. 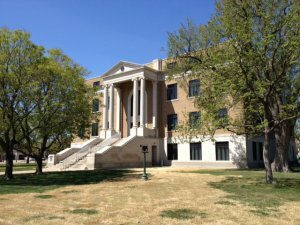 It overlooks the Santa Fe Trail to the south from the top of the hill. Lobdell was a state representative in 1891, and speaker of the House in 1895. President Wilson named him to the Federal Land Bank Board. He resumed his practice in 1929 in New York and died in Allendale, NJ in 1949 at age 87. Don Burnett grew up in this stately Colonial house. His father and mother ran the State Theatre. 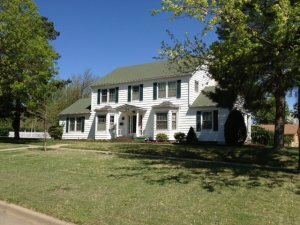 This house was built by George Wadsworth in 1886 and is on the National Registry of Historical Places. It is a Late Victorian Queen Anne type. The House was later owned by A. 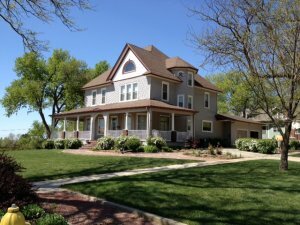 A. Doerr, called "Double-A" for short who, in 1912 opened a mercantile in Larned and branched off into manufacturing metal buildings and stock tanks for farms for 38 years. The Doerr's-Ace Hardware Store at the corner of 6th & Broadway is the existing legacy of Doerr's mercantile. 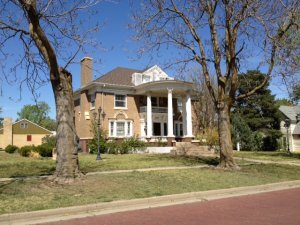 At his death in 1950 over 19 cubic feet of documents and manuscripts of his various busineses in Pawnee County were donated to the state historical society. Edward G. Wickwire built this stately house with the wraparound porch. A pioneer druggist in Larned, Wickwire came out to Larned in 1885. His New England family traces its roots to early colonial times and back to the Norse invasion of England. 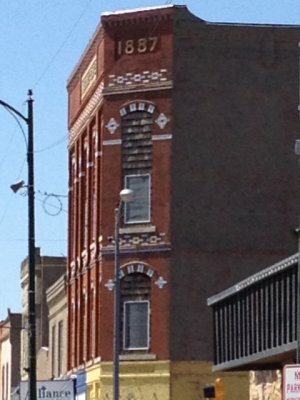 This Masonic building is located in downtown Larned, circa 1886. The building is still used for business.